Vegetarian Lunch, Three Ways | Naturally. Post sponsored by Arla USA. See below for more details. One of the hardest parts about cooking is finding a balance between family members. Most of the time I cook one dish and everyone eats the same meal but occasionally I get a wild hair and make a few different items. This most often happens with lunch. I pack my husband a quick lunch in the morning while Mack and I eat together in the afternoon. 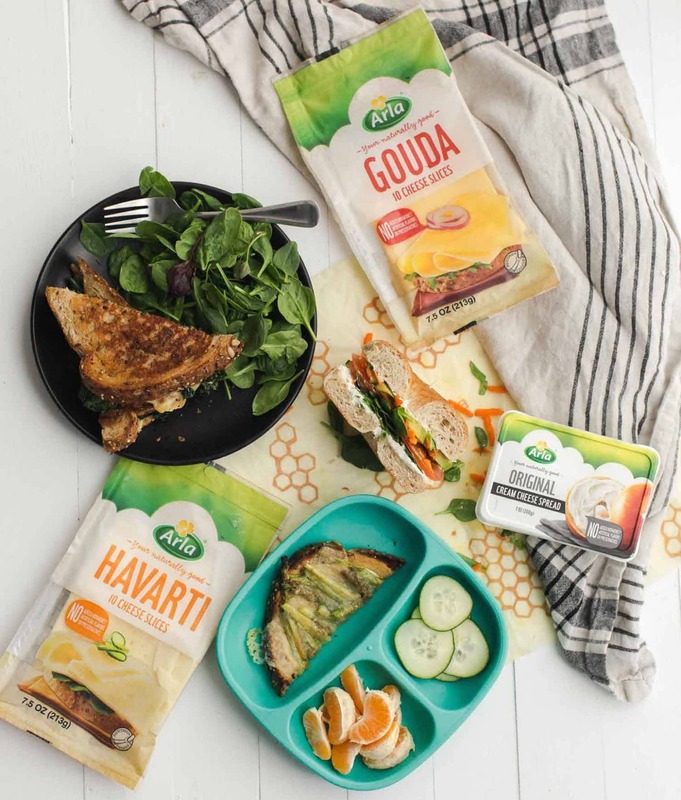 I partnered with Arla to bring you these three different recipes featuring their cream cheese and cheese slices made from quality, natural ingredients. Arla’s minimal ingredient cream cheese is the perfect, fresh balance for the hearty wheat bagel and fresh, raw vegetables. Beyond their herb and spice variety, I like to keep the original flavor on hand as well and mix in fresh herbs. Prep the vegetables as needed. 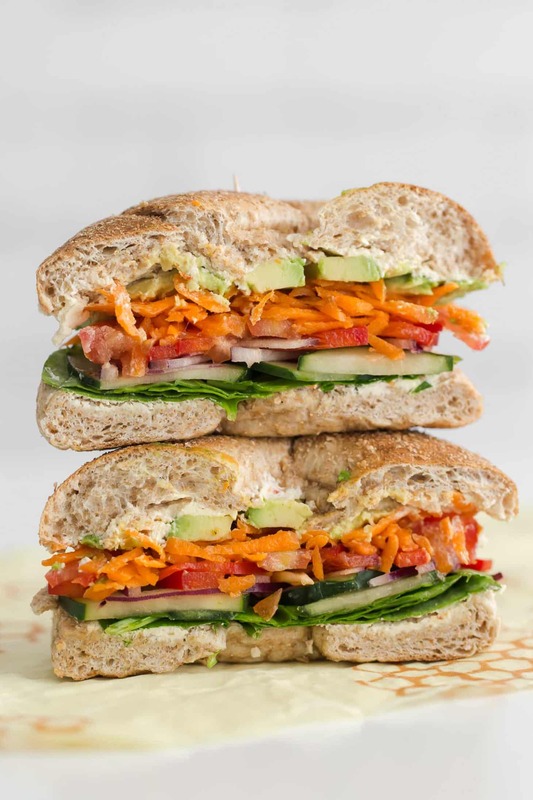 Assemble each bagel with 1 tablespoon cream cheese, layers of spinach, tomatoes, cucumbers, onions, carrots, and avocado. Spread 1 more tablespoon of cream cheese on the top half of the bagel. Place on top and serve. 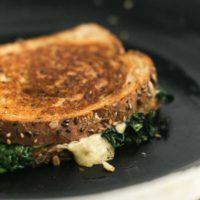 A grilled cheese sandwich fit for an adult loaded with wilted kale and perfectly melted gouda cheese. Roughly chop the kale and set aside. Heat a medium to large skillet over medium-low heat. Add the olive oil followed by the kale. Cook, stirring frequently, until the kale has wilted slightly, 3 to 4 minutes. Stir in the garlic and continue to cook until the garlic is fragrant and golden, 1 to 2 minutes. Remove kale from pan and set aside. Wipe out the pan and reduce heat to low. Take a small amount of butter and spread on one side of a piece of bread. Place the buttered side down in the pan and top with a slice of cheese, half the greens, and another slice of cheese. Brush another slice of bread with butter and top, leaving the buttered side up. Cook until the bread is golden. Flip, and continue to cook until the cheese has melted and both sides are golden. If the cheese has melted but the bread has not fully toasted, turn up the heat slightly. Remove from the skillet, slice in half, and serve with a side of hummus if desired. 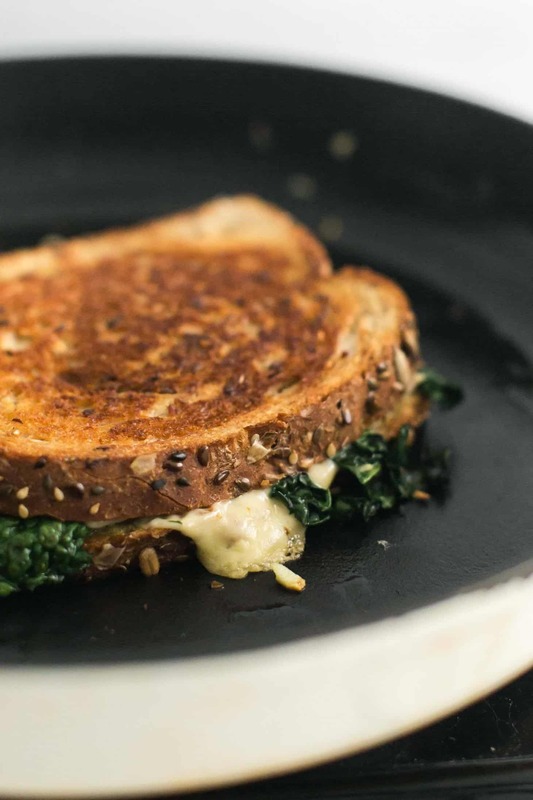 Make the garlicky greens ahead of time to make this grilled cheese faster. 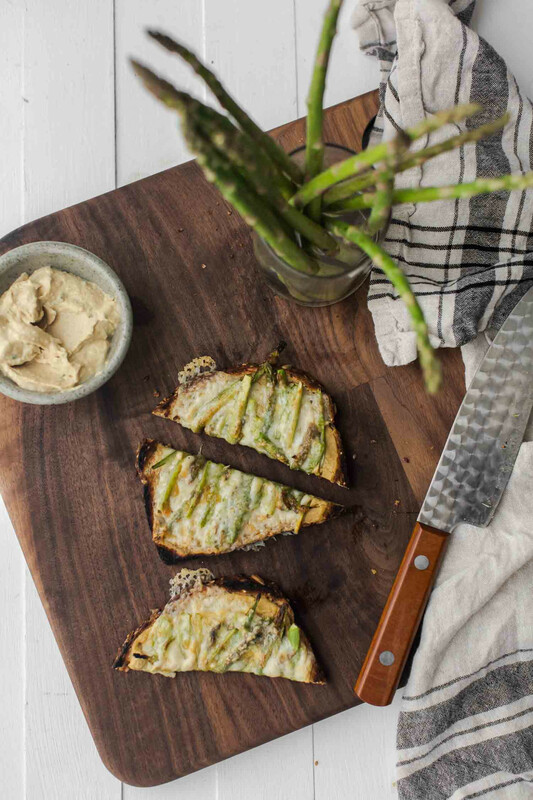 A fun way to get children to eat asparagus: roasted and paired with hummus and creamy melted havarti cheese. Place rack towards the top of the oven and preheat the broiler. Trim about 1” from the ends of the asparagus then cut eat stalk in half then cut each half lengthwise. Place on a sheet tray and toss with olive oil and a pinch of salt. Roast the asparagus until slightly tender and beginning to char, 1 to 2 minutes. Keep a close eye on the asparagus as it will cook quickly. Take two slices of spread and spread on the hummus. 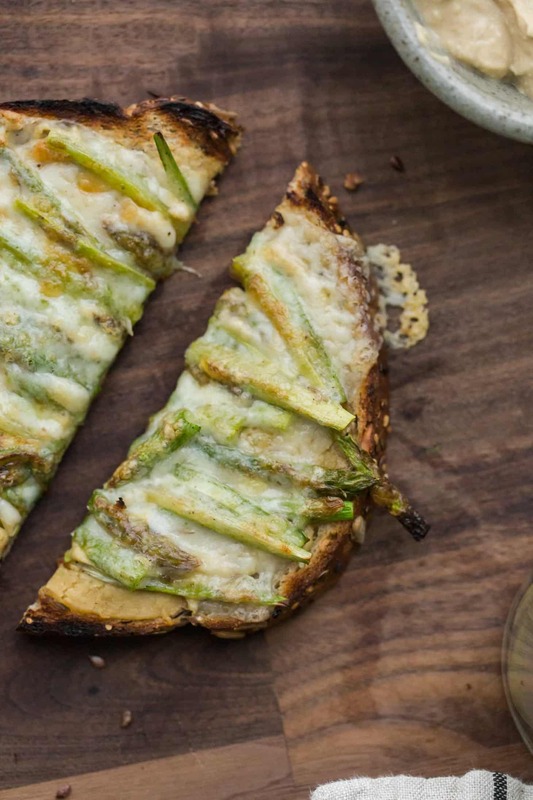 Divide the asparagus on top of each piece of bread and finish with a slice of havarti. Return the tray to the oven and cook until the cheese is melted, 45 to 60 seconds. This will result in a crisp top/sides but still soft piece of bread. If a crisp piece of bread is desired, place rack towards the middle of oven and lightly toast the bread before assembling. Also, instead of roasting the asparagus, you could shave and leave raw before placing the toast under the broiler. Each of the lunch recipes above can be adapted based on items you might have on hand. Instead of buying bagels, just stick to bread. Need a recipe to be gluten-free? Swap in your favorite gluten-free products. Just remember to load up the vegetables on all the recipes! Bagel Sandwich: Bagels can be on the heavier side. 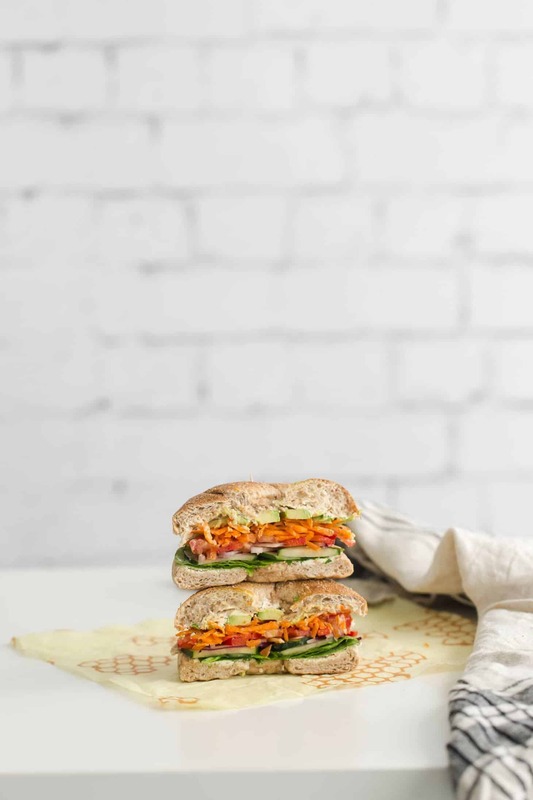 Try this sandwich with regular whole wheat bread or as a wrap. 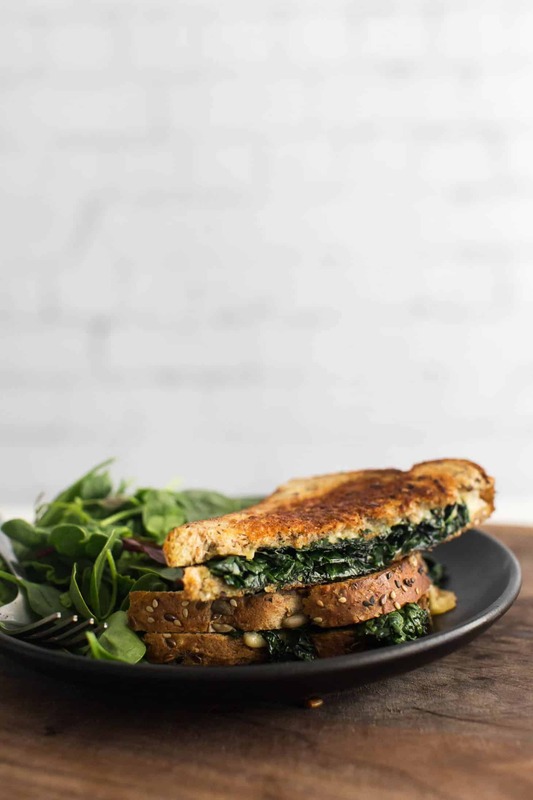 Kale Grilled Cheese: Use spinach or chard- both work well with the garlic. I also love using a combination of the havarti and gouda on the sandwich. Disclosure: This recipe was created in partnership with Arla USA. All thoughts and opinions are my own. 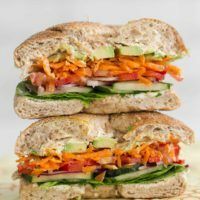 It’s content like this that helps me keep this site running to provide the vegetarian recipes you see every week. Hey Erin, do you know if Raley’s carries Arla products? I’d love to try them! I believe they do! I picked my up at Safeway (close to my house) but I remember seeing Raley’s on the list! I’m loving all 3 of these ideas and it’s so cool that you included individual videos, thanks! Any suggestions for bread other than franken wheat ? You can use whatever type of bread you like. Variety is always a good thing. 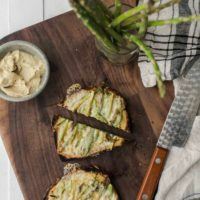 I love the asparagus hummus toast, yum!